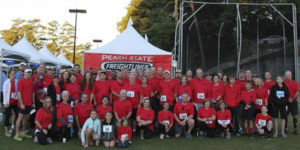 Peach State Truck Centers was named one of the Healthiest Employers in Atlanta by the Atlanta Business Chronicle and the Healthiest Employers of America, Atlanta Division. The Healthiest Employer of Atlanta honors companies that are committed to a healthy workplace through corporate wellness. Peach State placed ninth in the large employer category (500 to 4,999 employees). “Our wellness strategy had to address not just physical wellness, but a wellness triangle, which includes emotional and financial wellness,” said Bill Garrett, director of human resources for Peach State Truck Centers. Peach State partners with various organizations to help with implementation of their wellness strategy. Each partner plays a role in the programs that comprise the three-pronged approach to wellness – physical, emotional and financial. “Our partners hold us accountable to our goal of being employer of choice, while routinely optimizing the effectiveness of our programs,” said Garrett. Physical challenges are held each month for employees to participate in with prizes going to the winners. Chaplains are available to employees for personal counseling about work, family, stress and other life issues. Expert financial counseling also is available to Peach State staff to help with wealth management and goal-setting.